In the evening I installed the six add-ons for Firefox I love to use. Note that each add-on requires a restart after installation. I recommend to follow this recommendation to avoid issues. Moreover, Tree Style Tab required an additional restart of Firefox after I had made three changes to its appearance. The first Firefox add-on I installed was "Live HTTP Headers" version 0.17 by Daniel Savard and Nikolas Coukouma. I often use this add-on in order to find out what the browser exactly sends to a web server and what the response is so I can reproduce this in web scraping Perl programs I write. This add-on also makes it easy to follow redirects. Visit the Live HTTP Headers page to install it in Firefox. Visit the Web Developer page to install this highly recommended Firefox add-on. Since I had already installed the Adobe Flash Player version 11 over a week ago it was about time to install Flashblock by Lorenzo Colitti and Philip Chee. Instead of an animation and/or sound I'll get a "play" button and the Flash animation will only download when I give permission by clicking the "play" button. A must have, especially when visiting sites with several very annoying animated large advertisements. Hence, add-on number three I installed was Flashblock version 1.5.15.1. Visit the Flashblock page to install this must-have add-on. Some time ago I decided to give the Firemacs add-on, by Kazu Yamamoto, a try since I had switched to Emacs, a very sophisticated editor with "weird" key bindings. However, I somehow couldn't get used to Emacs key bindings in Firefox. Recently I decided to give this add-on another try -- I got tired of Ctrl+S opening a "Save as" dialog window instead of searching forward -- and this time it clicked. So number four installed was Firemacs version 4.3. Visit the Firemacs page to install this add-on. Highly recommended if you use Emacs often. The next add-on I installed was the one that stopped me from writing this all as a blog entry yesterday; Copy URL+. After quite some sleuthing in the afternoon I finally managed to get this add-on to work with Firefox version 3.6.18 on Ubuntu. It turned out that somehow the file chrome.manifest was not created during installation of this add-on. Adding this file from a backup of a profile directory with a working installation of Copy URL+ to copyurlplus-v1.3.2.xpi with an already modified install.rdf -- required to install version 1.3.2 with a recent version of Firefox -- did the trick and resulted in an XPI that I could install. Just unpack the tarball and drag & drop the XPI file on Firefox. The user.js file customizes Copy URL+ as described in Copy URL+ extension for Firefox. Besides the entries given in that blog post I've added two more to support pasting links in Emacs Org mode. Note that this add-on should also work on Microsoft Windows; if you can't extract the file download and install 7-Zip. If you want to give my user.js a try copy it in your Firefox profile directory but make sure not to overwrite an existing user.js. Last but for sure not least I installed "Tree Style Tab" version 0.12.2011061701 by Shimoda "Piro" Hiroshi. I've been using this add-on for quite some time and I really don't understand why this is not default in Firefox; vertical tabs are more readable if you have more than a handful of tabs open. Moreover this add-on allows one to organize and reorganize open tabs in a tree structure. In other words, a must have installed add-on, in my opinion. Visit the Tree Style Tab page to install this handy add-on in Firefox. My Tree Style Tab Appearance settings. Note: after I had changed the defaults to the above settings I had to restart Firefox in order to be able to resize the area taken up by Tree Style Tab. If Firefox asks you to "save your tabs for the next time it starts" tick the box in front of "Do not ask next time" and click the "Save and Quit" button. From now on Firefox will save your tabs and on restart load them back into a handy tree layout. 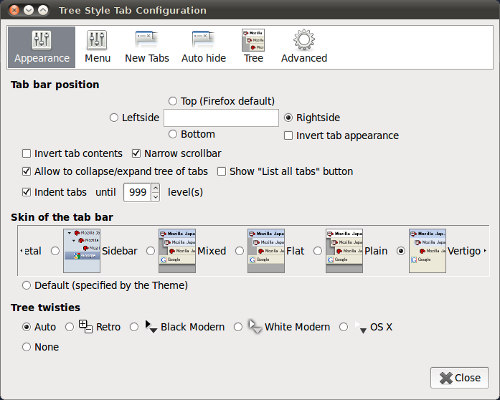 Tree Style Tab in action. 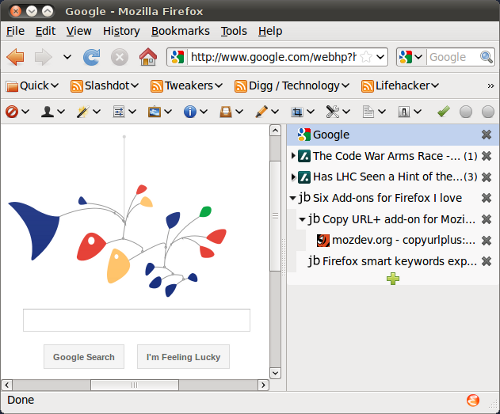 The above screen capture shows how tabs are displayed after the installation of "Tree Style Tab" followed by the changes in appearance. Some quick "Tree Style Tab" tips that work on Linux and Windows; the key and mouse bindings on OS X might be different. You can drag and drop tabs to reorden them. You can make tabs children of other tabs and (re)group them. Ctrl+Shift+Tab reopens a closed tab. If you open a link with the middle mouse button it opens a new tab which becomes the child of the current one.